Rest as needed between all sets of exercise today. Post weights of power cleans and all 3 row attempts to comments. I have often said, if I were asked to present the results we see daily at GPP to a group of my peers - I would be laughed off the stage. Emily, thank you for this. Amazing performance. Amazing effort. Just amazing! "I just wanted to send a quick e-mail to thank you for your awesome workouts! ... I ran the St. George marathon about a month ago. I was super nervous because I hadn't run a marathon in about 6 years (pre marriage and pre-babies). My fastest times in all 12 of my previous marathons was 3:49. I really wanted to beat that time but wasn't sure what to expect. I trained less for this marathon then any of my previous marathons. I was consistent with doing the GPP workouts and then I would run a couple times a week as well and I did about 4 long runs. I ran the best race of my life. I crushed my PR and got a 3:30 and I felt amazing. I was running by Tuesday of the next week. I have never recovered that fast with any of my races. ... I love [these workouts] and I feel like they are the reason that I did so well in my race. Thank you! Can't wait to see what else I can achieve. Thank you, thank you!!" EPIC use of one's fitness. Family vacation hiking the Inca trail. 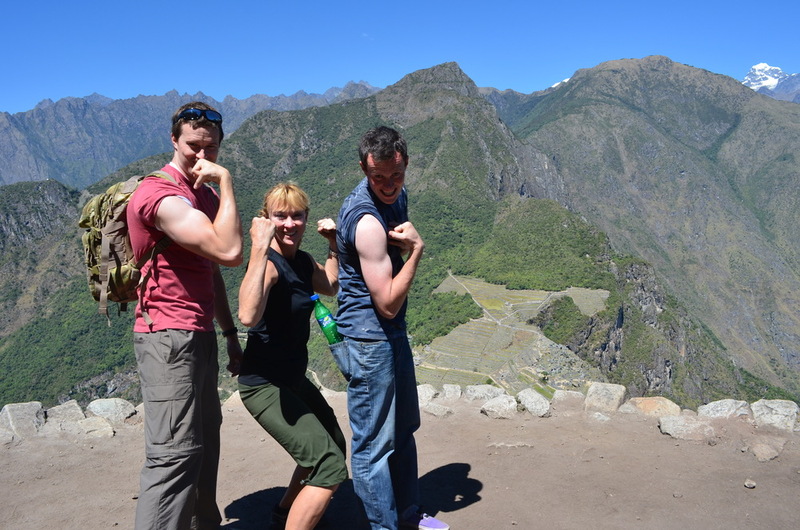 Justin, Jan & Jax over looking Machu Picchu.